As always It’s all about compression so we’ve created “Timbre” – an all tube vari-mu compressor based on the 6386 tube, inspired by the old, famous and much desired Gates STA-Level compressor. The Timbre is easy to use, full of color and sweetness. 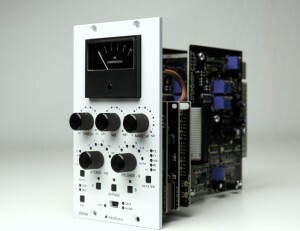 It is a vintage-style compressor made from the highest quality of components. Augmenting the design, we have added new features like the third mode of operation with shorter attack time, a high-pass sidechain filter, a link for stereo operation and a bypass function. Timbre utilizes a novel programme controlled release circuit which creates density and consistency while minimizing typical compressor side-effects at up to 40dB of gain reduction! The introduction of several significant structural improvements against the original version. One of the most important changes is two mode switch – Modern / Vintage – deciding on the circuit of the desymmetrization of the input signal. Modern Mode – is an electronic circuit, exactly the same as the previous version of the compressor and the Vintage mode – it’s a Carnhill input transformer. The result is a universal device with two different sound possibilities. A True Bypass switch was introduced, as well as a high-pass filter in the Compressor’s Side Chain path.There are three cutoff frequencies – 60, 90, 150 Hz – thanks to which Beta76 is less sensitive to low frequencies. The filter is particularly beneficial to the operation of two compressors in a stereo pair, which are easily connected with a prepared Jack-Jack cable. The entire system operates in class A. The element responsible for the gain reduction is a FET transistor, giving the effect of rapid and pure compression. There is a high quality Carnhill audio transformer on the output favourably affecting the final sound of the compressor. The housing is made from high quality brushed stainless steel, whereas the panel is 4mm brushed aluminium. It implements famous stereo bus compressor design made with best components available on the market. Unit is fully compatible with GCon protocol which allows complete parameters management over USB or through open specification 500 series frame – _TITAN. Besides its vintage and transparent nature, unit itself implements many modern features which brings extreme flexibility to shape your sound – like parallel compression or configurable harmonic distortion.